Belts and Gloves in Florence come in all qualities. The street stalls all over town offer extremely low priced goods, even as low as €10. But so do some shops! Don't assume that an outside vendor will have lower prices - shops offer higher quality and often match the stalls for prices on some items (see below). Florence has some lovely higher quality shops where you can find leather belts or gloves made with impressive artisan craftsmanship. And the great news is that since basically we're still talking about small items, even very high quality goods are quite affordable! A belt or pair of gloves made with quality leather and with care and attention to the finer details will give you a different kind of satisfaction (and, of course, will last much longer). Whether you want to buy some very reasonably priced belts and gloves in Florence or are looking for something a little more special, the recommendations here will point you in the right direction. 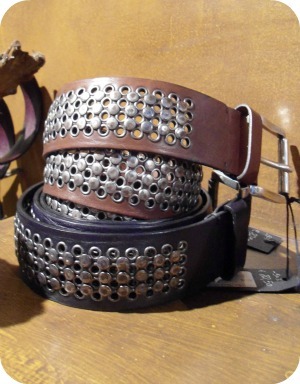 Marcus is the only shop in Florence that deals exclusively in belts. When a business focuses on only one product, they tend to excel in what they do, and I think this is the case here. Patrizia and Marco have been working in the small niche of belt production for over 25 years and they really know their stuff. All belts are made in the Florence area following the Italian leather working tradition. The selection is extremely vast for both men and women: traditional calfskin and lambskin, reversible belts, patent leather, textured leather, nappa, and more. There is also a huge choice of buckles from classic looks in solid brass to elaborately worked metal with rhinestone embellishments (pic below). 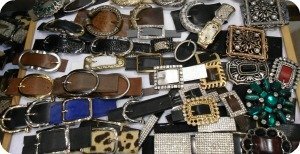 You can choose a buckle that you like and have it added to the belt of your choice. 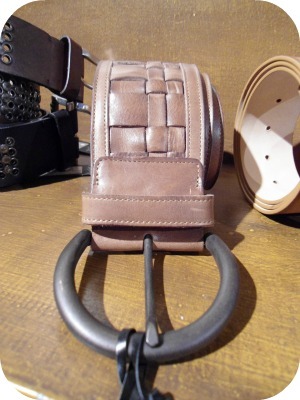 Belts can be made-to-order, re-sized, and adapted right in the store. This is a perfect example of a shop that can compete with a market stall on prices for many items but whose quality is much higher. 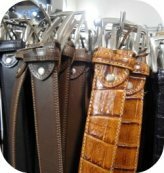 For ladies who are looking for something fancier, Marcus also has a great selection of ornate belts made of snake skin, crocodile, and other elegant leathers (see below). These belts have hand-crafted buckles adorned with intricate features like semi-precious stones and artisanally designed metal works. This is a new shop in Florence that is offering something unique and modern. What’s special about the goods is the highly personal style: the owners see their leather items as a cross between vintage and avant-garde. I call this type of leather good a 'rock' style - it's just as cool and tough as can be. 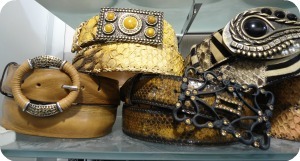 They have gorgeous belts, with laser-etched designs, brass studs and other special touches that are truly original. Also the quality and colors of the leather can't go without being noticed: rich deep earthy browns in all shades and thick oiled leather that reminds you of the kind of beautiful leather goods used by wranglers. The shop has bags and wallets too, in this same style. You can also find inexpensive belts at the many outdoor markets in Florence. 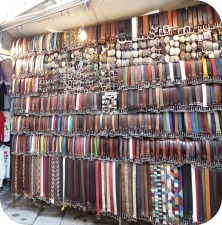 The largest selection of belts is at the San Lorenzo market in the heart of town. 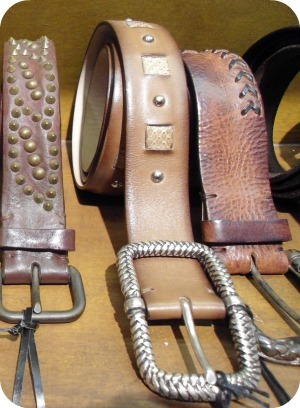 And, if you're also looking for leather bags and other small leather goods in Florence, the family run artisan shop Gioia Chiara has a small selection of classic style belts. Read about this shop on the Handmade Leather Bags and Goods page. 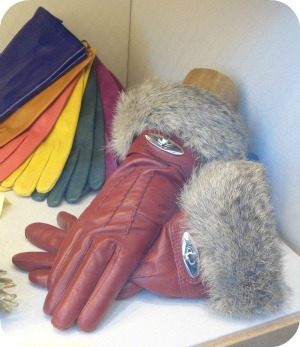 Madova is the first name in gloves in Florence. This is the only shop in town dedicated exclusively to their own production of leather gloves (Madova is a 4th generation family-run business). 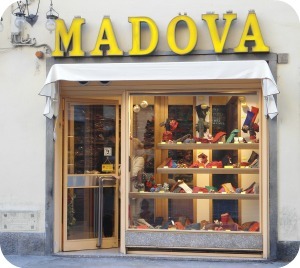 While there are many glove shops in Florence, Madova is unique in that it is the one shop that sells only the gloves that the family itself produces and whose gloves can be bought only from the producers. Similarly to the belt shop Marcus (above), by focusing on this one sole product, Madova has firmly established itself as the market leader for quality, style, reputation and good value. In fact, the shop offers top-of-the-line leather craftsmanship at competitive prices. You may spend 20-30% more here compared to other shops, but the product you purchase will be of another category. And like I said at the beginning of the page, gloves - being a small item - are never going to make you break the bank. Even a 'costly' pair of gloves can go for well under €100 at Madova. The shop has a vast selection for men and women. Martelli is a shop that is always full of tourists. Part of the shop name is 'glove factory' and this is fitting. 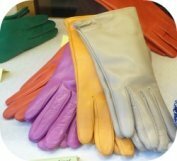 The gloves fly over the counter into happy shoppers' bags at assembly line speed. 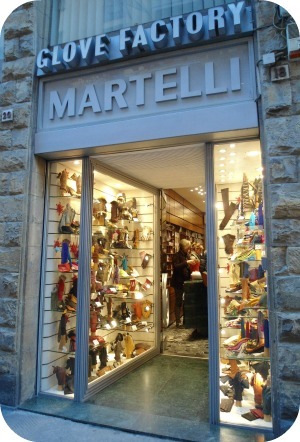 Martelli is more popular with vacationers than locals, probably because this hustle-bustle of constant tourists probably detracts from the local appeal of the shop. But the gloves here are a very good middle road between a market quality glove and the higher-end goods such as Madova gloves (above).